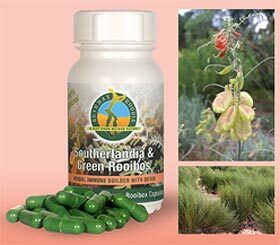 all medicinal plants in Southern Africa.A safe tonic for diverse health conditions and a long history of use by all cultures in Southern Africa. Sutherlandia powerfully assists the body to mobilize its own resources to cope with diverse physical and mental stresses. Is the unfermented version of Rooibos. This tea contains high levels of polyphenolic anti-oxidants and aspalathin.Rooibos Tee (Red Bush Tea) promotes anti-aging. Antioxidants in Rooibos help in destroying free radicals that attack and damage healthy cells. It contains calcium, Potassium, Magnesium, Zinc, fluoride and Iron. Rooibos helps to control allergies. It also contains, Aspalathin, a flavoured found in medicinal herbs that are used to treat skin disorders and circulatory disorders. Flavanoids found in Rooibos may also have anti-inflammatory and anti-allergic properties. Rooibos is free of colourants and preservatives.